Get ready for summer with this festive appetizer! 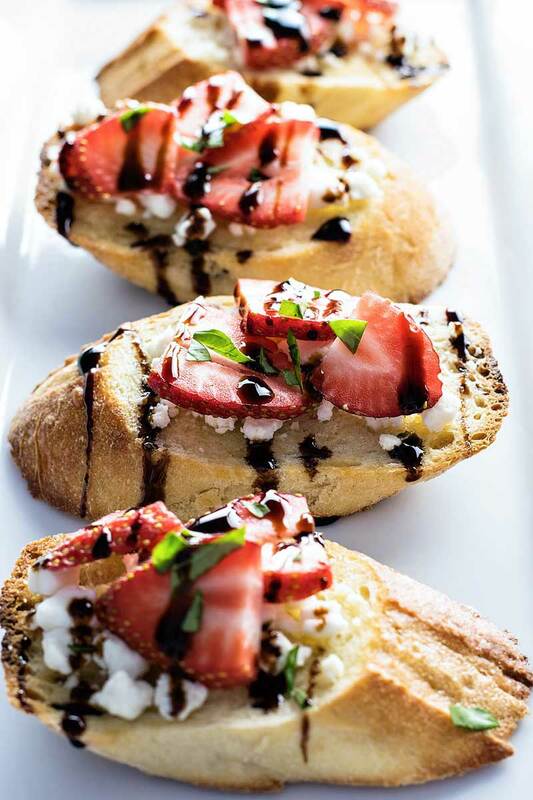 Sweet strawberries, tart balsamic, flavorful basil, and tangy goat cheese, all on a comforting baguette. For anyone that’s visited this little food blog before, you might already know how much I love appetizers – because, seriously, they’re like my lifeblood – and if you’ve been with me for the past year (is that you!? *high five! *) you know that I’m mildly obsessed with all things balsamic. Ever since I embraced the beauty of this slightly tart dressing/glaze/marinade I’ve become convinced that it’s an absolute culinary wonder for all savory (and sometimes sweet) foods. The answer to that is almost always yes. I’ve been wanting to make another balsamic-glazed appetizer for a while now, but it hasn’t felt like the “right” time. For better or for worse, I tend to think of balsamic as a summery flavor, and whether it’s been the unseasonably warm weather we’ve been having – yes, even for Phoenix – or just a good dose wishful thinking, for the first time in months I felt like I simply had to have a tasty balsamic dish. Went straight to the store to get it. My original plan was to make a salad, but then I walked by the bakery. Because I have no self-control always find my way to the bakery, whether I need a baked good or not, as if my subconscious knows that all I really want is to gaze at all the bread and frosting despite the fact that my conscious mind knows that I really can’t afford the new wardrobe all that chocolate and cheese would bring me. So, anyway, I was going to make a salad, but there I was at the bakery. Again. And then I spied the baguettes, all lined up in a pretty display, and suddenly I was hit when an even better idea for my lunch mid-day snack food extravaganza: bruschetta! I’ve had something very like this at a restaurant before and suddenly I just had to try making it myself. Couldn’t be that hard, right? And seriously, this strawberry and goat cheese bruschetta was so easy to throw together, and hits all the right marks: sweet strawberries, tart balsamic, flavorful basil, and tangy goat cheese, all on a comforting baguette. It’d make the perfect low-hassle appetizer at a house party, and you know what? We’re long overdue for hosting one. Not gonna lie, I may just organize the whole party just so I have a good excuse to make this bruschetta again. Because I have no self-control like to share good food with good friends. Place sliced baguette pieces on the parchment paper, about 1 inch apart, and brush the tops with olive oil. If desired, lightly season with salt and pepper. Bake bread for 5 minutes or until edges look golden brown. Be careful not to toast the bread too much. While bread is still warm, sprinkle (or spread) goat cheese on the sliced baguette. Arrange sliced strawberries on top, then sprinkle with basil. Finish by drizzling balsamic glaze on top. In a small sauce pan, bring 1 cup of balsamic vinegar to boil over medium heat. Reduce heat and let balsamic simmer for at least 20 minutes or until vinegar has reduced by 1/2. Use a spoon to test the glaze - it should leave a film on the back of the spoon when ready. Glaze will thicken more once removed from heat. Place glaze in the refrigerator until ready to use. If glaze thickens too much while resting, stir in 1/4 tsp of water at a time until desired consistency is reached. This will make more balsamic glaze than you need for the Bruschetta, but just store the extra in the fridge and use it on more tasty dishes! This really does look like the perfect appetizer! I love roasted strawberries and balsamic.